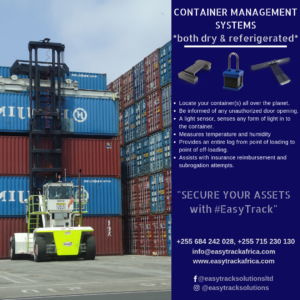 Easy Track Cargo Tracking solution helps track and protect valuable assets in transit and adds higher value service to fleet management administrators and systems. Easy Track Cargo Trackers facilitate secure transportation of valuable assets. Our services are available all over Tanzania and East/ Central Africa. We are one of the most trusted Telematics company in Tanzania. We provide tracking and security services to many reputable companies in Tanzania such as; Bollore Transport and Logistics, Forward Air, Tanzania Revenue Authority and Tanzania Ports Authority. 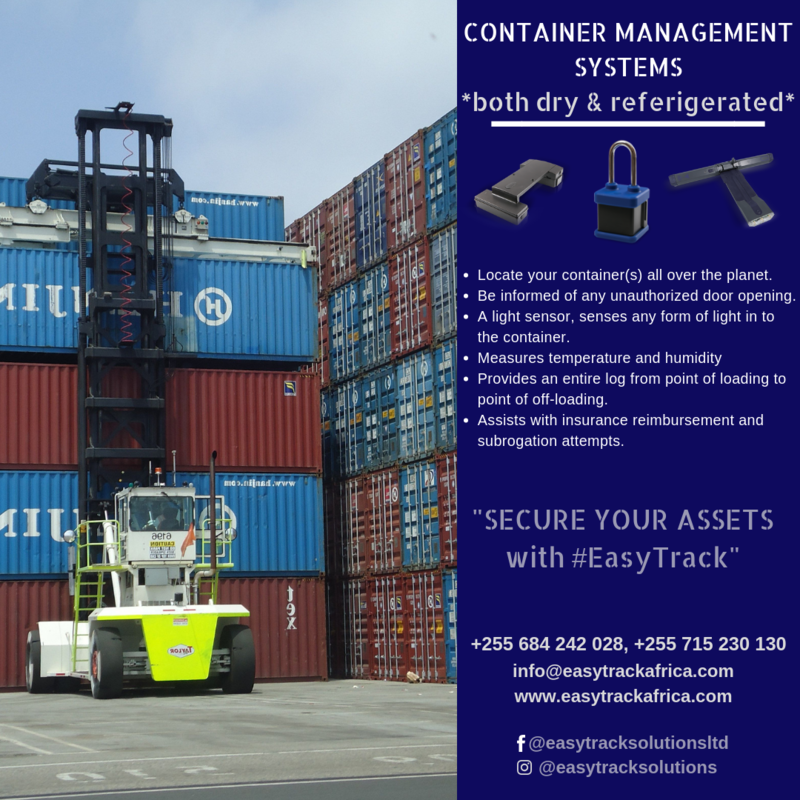 With this asset tracking system you can monitor your assets in real-time and receive cargo security status incase of any theft, tempering or diversion .This solution will enable a client gain visibility over their assets through live updates on its location and lock status in real time. Secure and track loaded containers. Secure and track cargo located in storage facilities including warehouses, dry ports, Special Economic Zones, bonded warehouses. Track and measure temperature in storage facilities for perishable goods. Secure luxury goods, arms and military equipment and hazardous materials. Reduction in cost of GIT (Goods In Transit) insurance Security of the cargo by sending instant alerts, incase of any theft or disarming of the device/ lock. Complete log history of the cargo including the time and location of the cargo. Easy Track Solutions Ltd is a private limited company established in 2014. We are an IT based firm specialized in providing innovative solutions. Our aim is to simplify and ease the day-to-day lifestyle of an individual by providing effective technological solutions for the corporate and public sectors.